The rabbit foot, the four leaf clover, the horseshoe, and the wishbone were used up in the first four games of the season and the New England Patriots finally ran out of luck and dropped their first game of the season in Week 5 versus the Cincinnati Bengals. It was a game highlighted by offensive frustration as the Patriots were without several key weapons and several more contributors were playing noticeably dinged up. The Patriots put out an anemic offensive performance and wasted a strong defensive performance losing 13-6 to the Bengals in their second consecutive road game versus a 2012 playoff team. Now looming in Week 6 is a return to Foxborough, MA to face the rejuvenated and undefeated New Orleans Saints on Sunday afternoon. Against Cincinnati, the theme was missed opportunities as dropped passes (six more by the Patriots’ backs and receivers, with newly active wide receiver Danny Amendola with three drops and running back Brandon Bolden with two drops) and poor execution on offense doomed another strong defensive performance. Wide receiver Kenbrell Thompkins was quiet in the passing game, likely due to a combination of extra attention after his play in the first quarter of the season and a nagging injury. Fellow rookie Aaron Dobson had another quiet showing in the passing game as well. The Patriots suffered primarily from a surprisingly poor performance up front by left guard Logan Mankins. Throughout the first quarter of the season, Mankins and tackles Sebastian Vollmer and Nate Solder were the strong backbone that allowed the Patriots offense to motor forward with just enough production to win. Last Sunday against the Bengals, tackle Geno Atkins had a field day blowing up the middle of the offensive line and opening the floodgates to get the Patriots’ quarterback on the ground consistently and disrupt the rhythm of the passing game. With three sacks, three hits, and six hurries, the Bengals defense won the fight in the trenches. 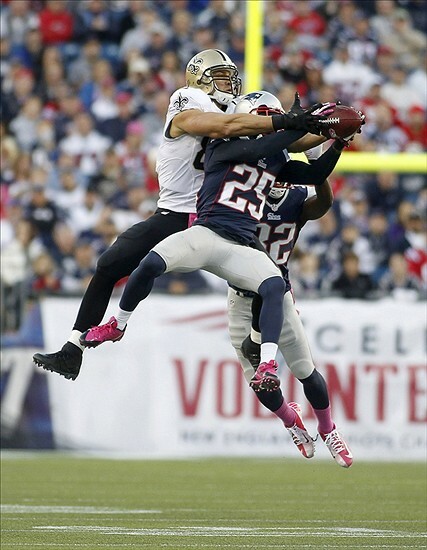 This week, the New Orleans Saints bring a multiple-weapon offense and an improving defense to Foxborough. On offense, the Patriots matchup against the talented Drew Brees. Despite the disappointing season last year, Brees threw over 40 touchdowns and 5,200 yards. His top target is the best tight end in the NFL not named Rob Gronkowski in tight end Jimmy Graham. Graham is a wide receiver in a tight end’s body and has continued to progress as he has six touchdowns in five games and almost 600 yards receiving. Finally, the third weapon in the arsenal is running back Darren Sproles. Sproles is a weapon like no other in the league with top-end receiving talent and off-the-chart quickness in the open field. Unlike Cincinnati and Atlanta, where the Patriots had the defensive game plan to take away one weapon (wide receiver Julio Jones and wide receiver A.J. Green) and let the other nine defenders do the rest, that plan goes out the window this week. Just matching-up with Graham is a headache, and Sproles has to be accounted for every time he steps on the field. Even taking away both of those, Drew Brees is one of the best quarterbacks at simply finding whoever is open and getting the ball to him in a hurry. Top wide receiver Marques Colston is having his usual excellent season, and running back Pierre Thomas has established himself as a receiving threat as well out of the backfield. The one weakness for New Orleans has been running the ball, and without Patriots’ defensive tackle Vince Wilfork (and Tommy Kelly’s knee injury status still unclear) the opportunity to try to get their running game going may be too strong for the Saints to resist. This year they have averaged 3.1 yards per carry with Pierre Thomas averaging less than 3.0 yards per carry. Backup (and first round pick from a trade with New England) Mark Ingram is averaging less than two yards per carry and is in danger of being passed on the depth chart by undrafted free agent Khiry Robinson. Sunday afternoon in Cincinnati was the definition of “frustration” for the New England Patriots. While another strong defensive effort was put forth by the New England defense, the Patriots offense was unable to get in gear all game long. As the skies opened up and the rain fell in the fourth quarter, the Patriots opened up their offense, but it was too little, too late against a strong Bengals defense. The Patriots offense never got anything going against Cincinnati defensive coordinator Mike “How in the World Has No One Hired Him as a Head Coach Yet?” Zimmer throughout the entire game. After a trading punts to open the second half, Cincinnati finally made some headway against New England working the middle of the field much like Atlanta had done with tight end Tony Gonzalez the week previous. While Cincinnati got to the 25 yard line, a sack by linebacker Jerod Mayo put the Bengals at the 32 yard line where they settled for a 50 yard field goal. After another ineffective Patriots drive, the Bengals finally found the end zone as they punched it in to take a 13-3 lead. The Bengals had some strong running by both BenJarvus Green-Ellis and rookie Gio Bernard to get down the field on an extended drive and get six on the board. The Patriots responded immediately, as quarterback Tom Brady found rookie wide receiver Aaron Dobson on a 56 yard pass. Unfortunately, Dobson fumbled, then recovered, and New England was on the 17 yard line. A pass to a diving danny Amendola put New England inside the one yard line. After running back Legarrette Blount was stopped on first down, the Patriots called a strange play: trying to complete a pass to tackle Nate Solder. On third down, Brady could not connect with wide receiver Julien Edelman, and the Cincinnati Bengals had a huge goal line stand to force the Patriots to kick a field goal. The New England Patriots lost their first game of the season to theCincinnati Bengals on Sunday afternoon. When a team does not score a touchdown, it is hard for them to walk away with a victory, and this game was no exception. The key to the game was in the trenches, and New England lost the battle on both sides of the ball, but especially on offense. A Patriots defense only allowing one touchdown should be an automatic win, but that was not the way of the game. In fact, here are three key factors that led to the Patriots loss to the Cincinnati Bengals on Sunday. Tom Brady had a bad game. That’s what it boils down to at the end of the day. When Brady struggles, the team (unless they have Richard Seymour, Ty Law, Tedy Bruschi, Mike Vrabel, and either Rodney Harrison or Lawyer Milloy on defense) is not very likely to notch a win. With a dinged up receiving corps, Brady had some issues with the receivers as a returning from injury, but out-of-sync wide receiver Danny Amendola dropped three passes and second year running back Brandon Bolden added a couple of drops as well. Wide receiver Kenbrell Thompkins was clearly limited and struggled to get open against a sub-par Cincinnati secondary. Slot wide receiver Julian Edelman only caught two of five targets as did rookie wide receiver Aaron Dobson. If there was a game that the team desperately missed all-world tight end Rob Gronkowski in the passing game, this was the game. Especially galling was when Danny Amendola’s rolling reception was downed at the one yard line. First off, it was surprising that New England did not challenge the ruling he was contacted by the Cincinnati defender and down before the ball crossed the goal line. Second, the team ran LeGarrette Blount behind tackle Nate Solder and guard Logan Mankins on first down. Then, the team went to trickery and tried to connect with left tackle eligible receiver Nate Solder on a ridiculous call. Finally, on third down and goal, the Patriots missed running back Stevan Ridley and his nose for the end zone as they tried to connect to their shortest receiver (Edelman) in a goal line situation rather than try to power the ball into the end zone. Quarterback Tom Brady did not throw an interception until the last drive of the game when the team was out of timeouts and the clock was ticking down. But again, his accuracy and sync with the receivers was a point of contention. Of course, the biggest factor to stopping Brady (as the New York Giants of 2007 and 2012 can attest to) is getting pressure with a four man rush up the middle of the offensive line. Cincinnati put Brady on his back with pressure, knock-downs, and sacks with regularity on Sunday.